Laughing October 28 on Netflix, Skylanders Academy taps top animation, voice and production talent to make the toys-to-life game characters livelier than ever. Check out the official trailer. Along with this year's instalment of the hit video game franchise, Skylanders Academy gives characters like Spyro, Stealth Elf, Eruptor, Jet-Vac and Pop Fizz much more personality. In previous game installments these characters were limited to one-liners, with non-player characters handling narrative duties. 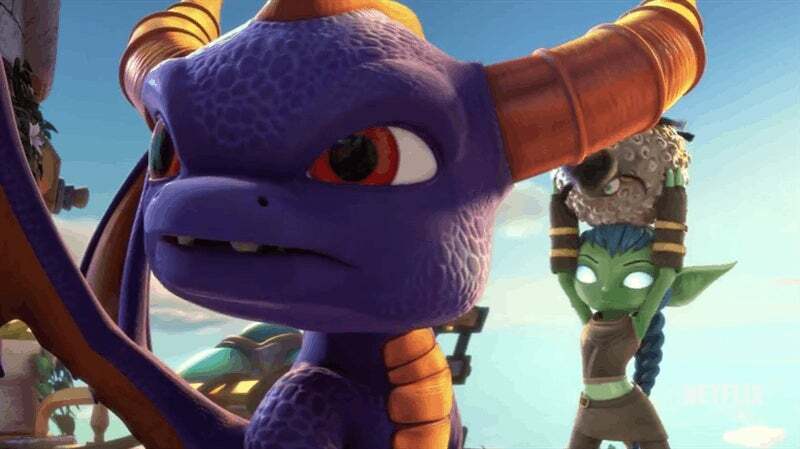 We've Justin Long as Spyro, Ashley Tisdale as Stealth Elf, Jonathan Banks as Eruptor, Bobcat Goldthwait as Pop Fizz, and additional voices provided by Susan Sarandon, Daniel Wu, Parker Posey, James Hetfield and many other people in the entertainment industry whose children or grandchildren begged them to do this. Animated by France's TeamTO and overseen by Activision Blizzard Studios, Skylanders Academy has all the makings of a good time. The first season launches October 28, with a second already penciled in for late 2017.